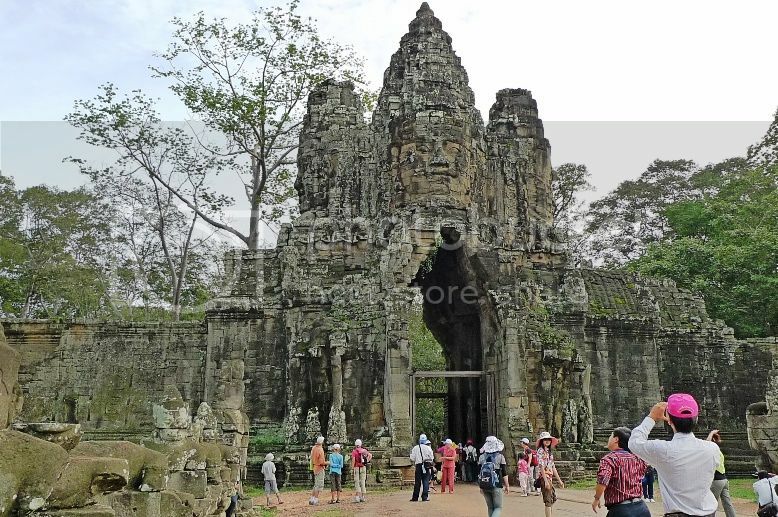 There are 5 ways to enter Angkor Thom - the last and most enduring capital city of the Khmer Empire. 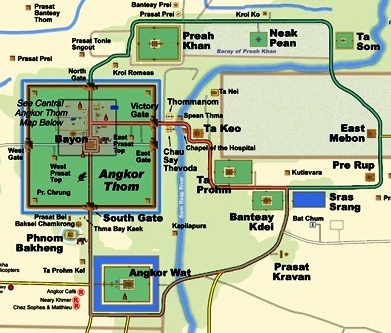 You can enter via the North Gate, South Gate, East Gate, West Gate and the Victory Gate, which is slightly north of East Gate. No one enters via the East Gate, which is known as the "Gate Of The Dead". 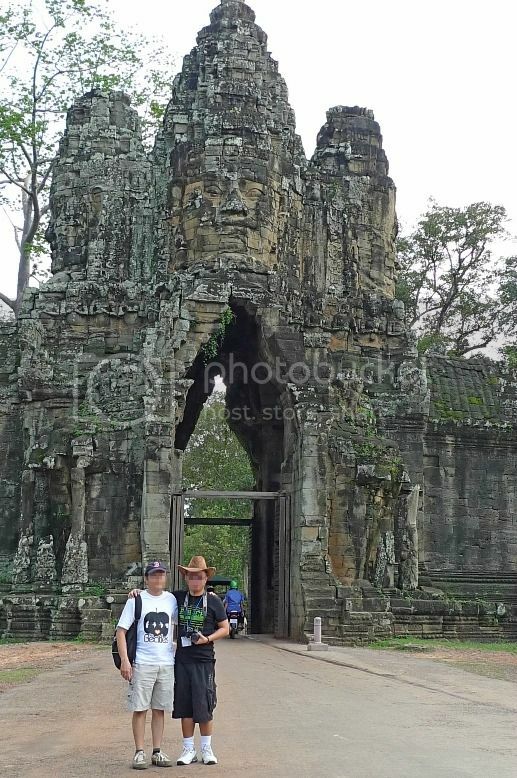 During our first day in Siem Reap, Cambodia, Jam, his friend and I visited the Bayon Temple, which is located in the middle of Angkor Thom. 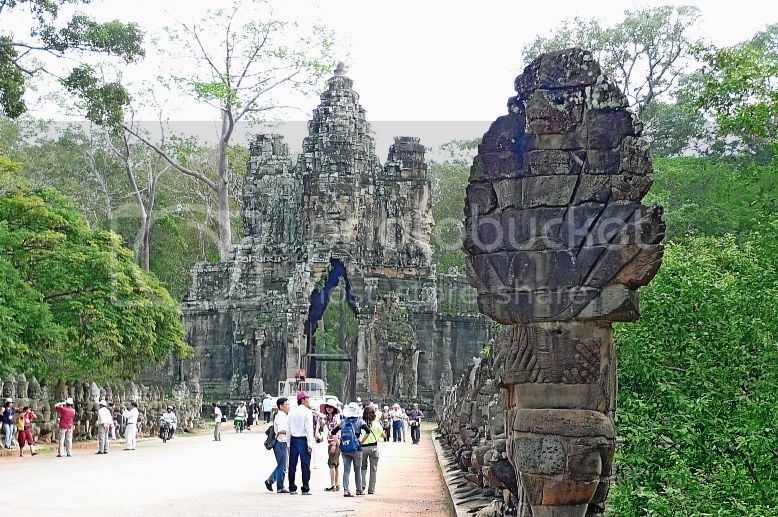 At that time, we entered Angkor Thom via the Victory Gate. Read more HERE. 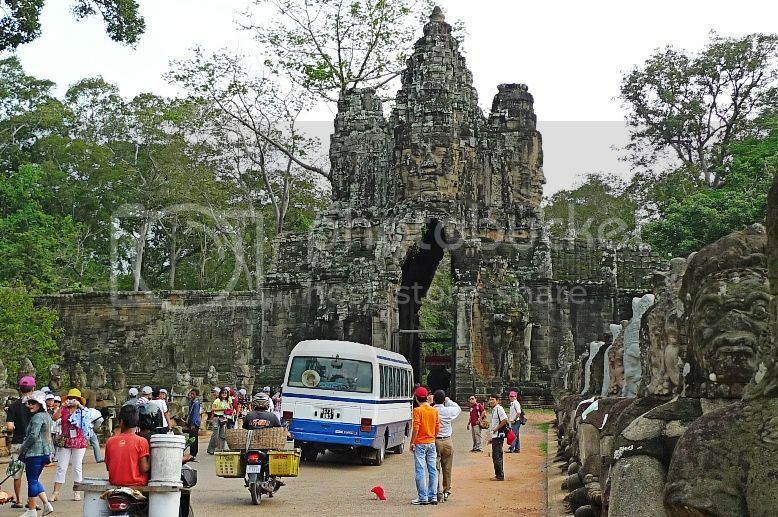 We visited Angkor Thom again on our second day, but this time we entered using the more popular route, via the South Gate. A naga (or 7-headed serpent)'s tail faced us on the right side as we walked along the causeway. There were more tourists at the causeway leading to this gate, and it was not difficult to see why. 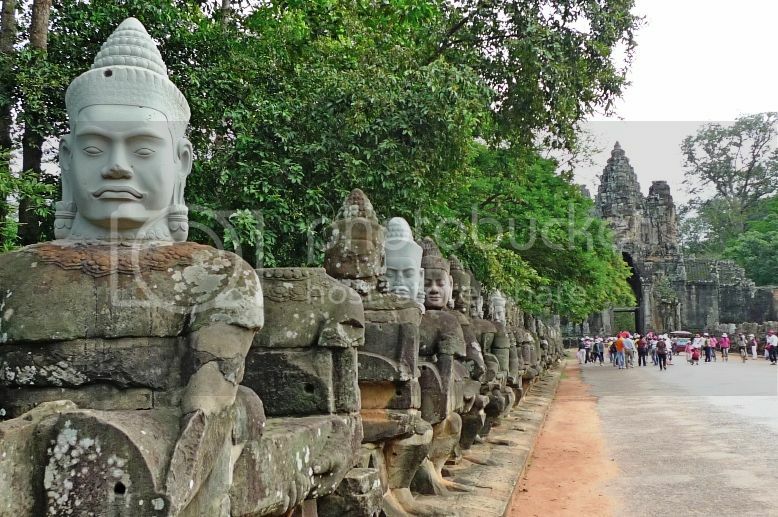 The rock statues forming on both sides of the causeway here were the best preserved among all the five gates. Behind the serpent's tail was a row of 54 demons or asuras. They were actually holding onto the naga and pulling its tail. Compared to the Victory Gate which we visited on our first day, the asuras were more well maintained here. At least most of the bodies still have their heads intact! 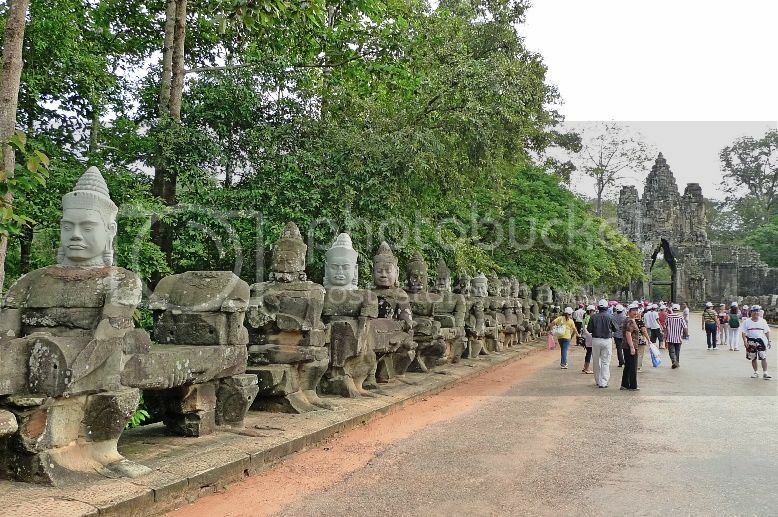 On the left side of the causeway, a row of 54 gods or devas could be seen holding on to the other end of the naga, which was its head. Oh! 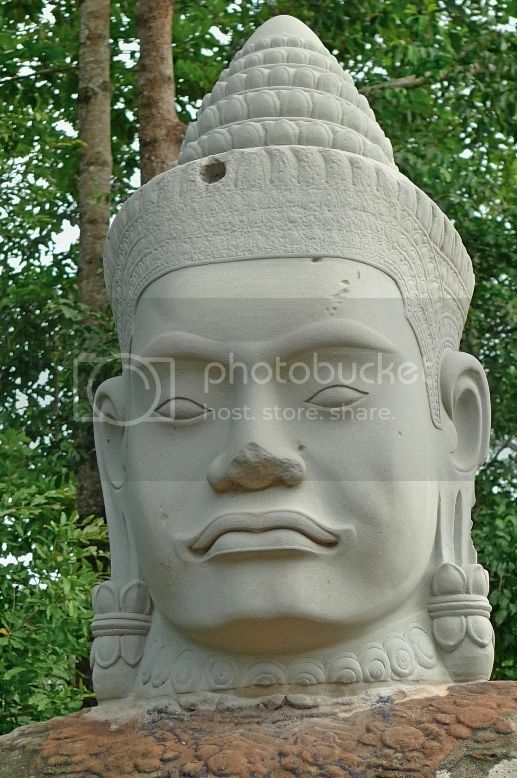 I forgot to capture a photo of the naga's 7 heads, but I think you would have already seen it if you had read one of my earlier posts HERE. Many believe that the naga balustrades linked the world of men to the world of gods once they entered into the city. The devas and asuras were engaging in a tug-of-war by pulling onto the naga in opposite directions to symbolize the churning of the ocean milk to extract the elixir of life. 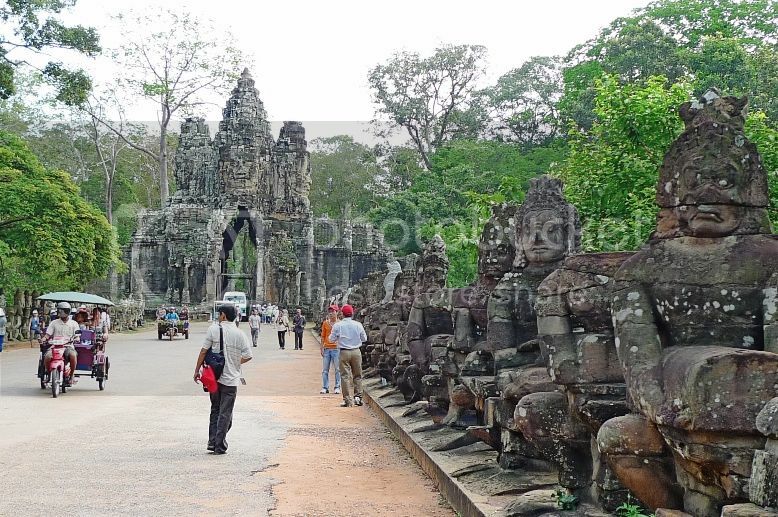 Finally I got to see the devas more clearly as the ones I saw at the Victory Gate had their heads missing! I guess these were new heads being placed there as the older versions were of different colour. 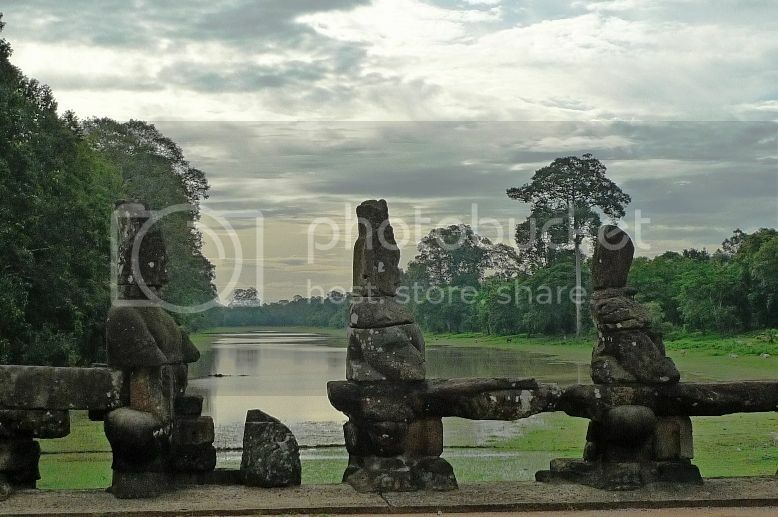 The causeway was built across a 100 metre-wide moat which surrounds Angkor Thom. 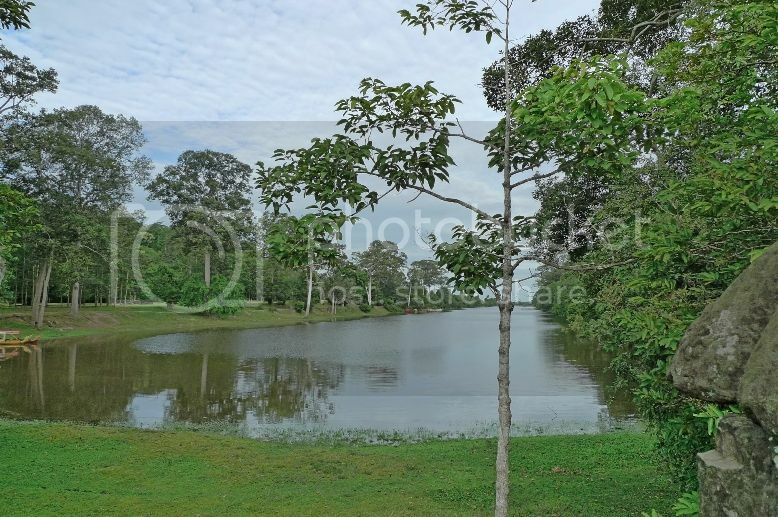 The morning weather was pretty pleasant and I felt calm looking at the moat. I was day dreaming looking at the fine scenery when I was interrupted by some sound behind me. Looking back, I saw..... elephants!! 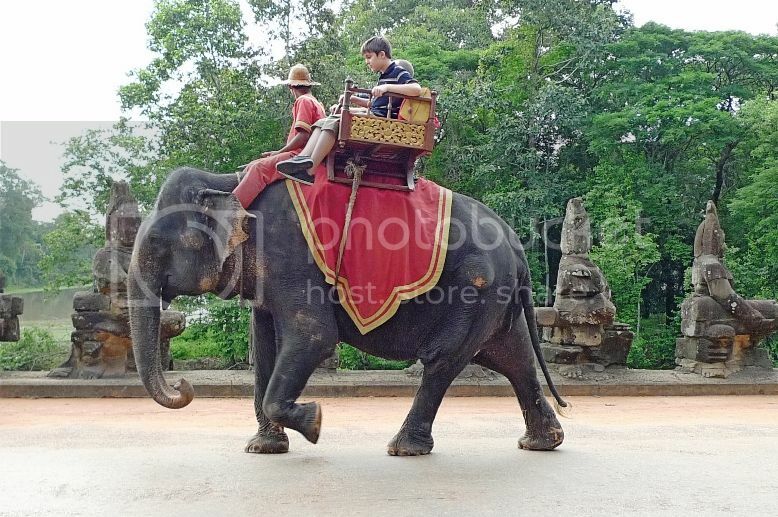 A number of elephants were walking past us, with tourists sitting on top of them! 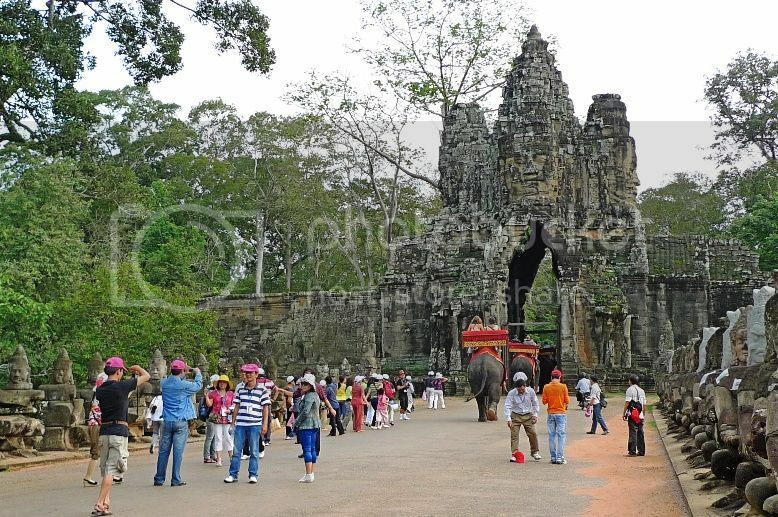 These elephants walking past the moat towards Angkor Thom was a sight to behold! 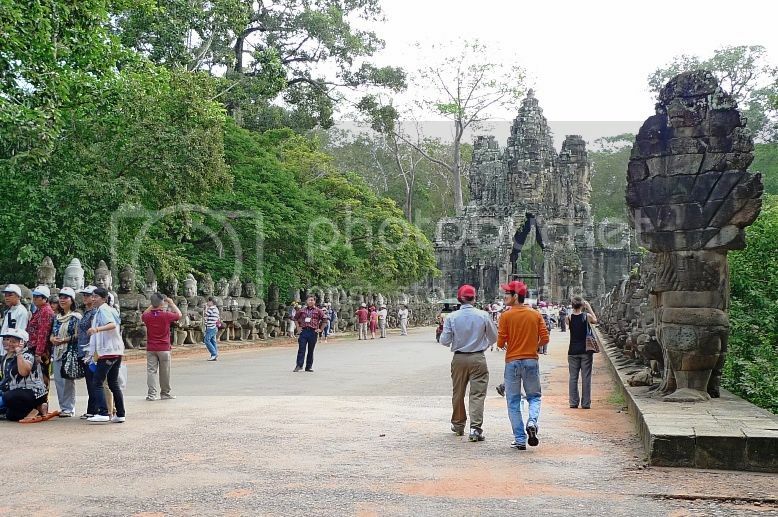 They lent a carnival atmosphere to the place, with many tourists on the ground busily snapping away pictures. 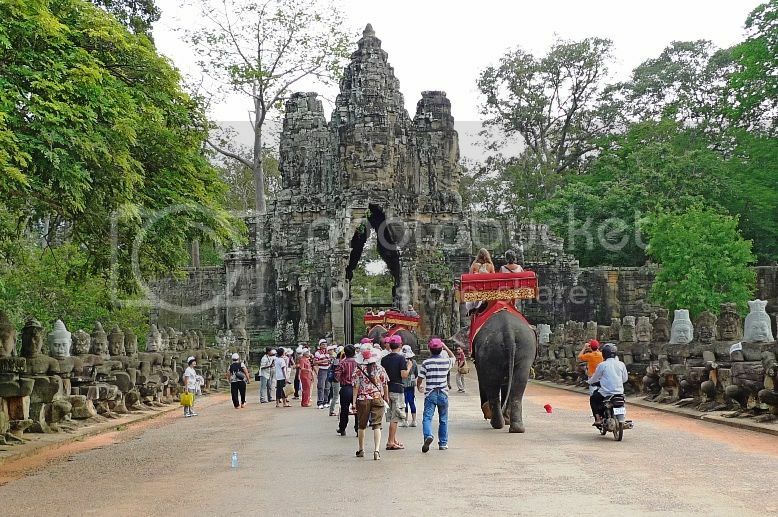 Soon, the last of the elephants had walked past us towards the South Gate. 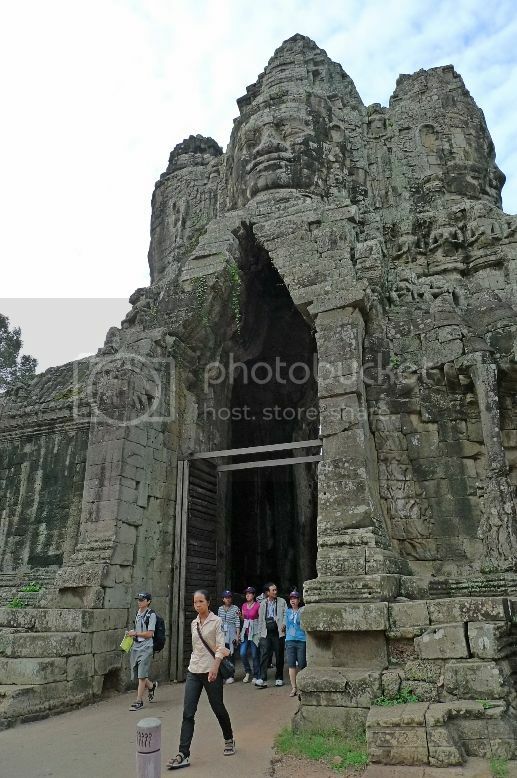 There were many tourists posing and taking pictures in front of the gate. I waited for the most of the tourists to leave as I wanted to take a photo of myself in front of this historical gate without them blocking me. 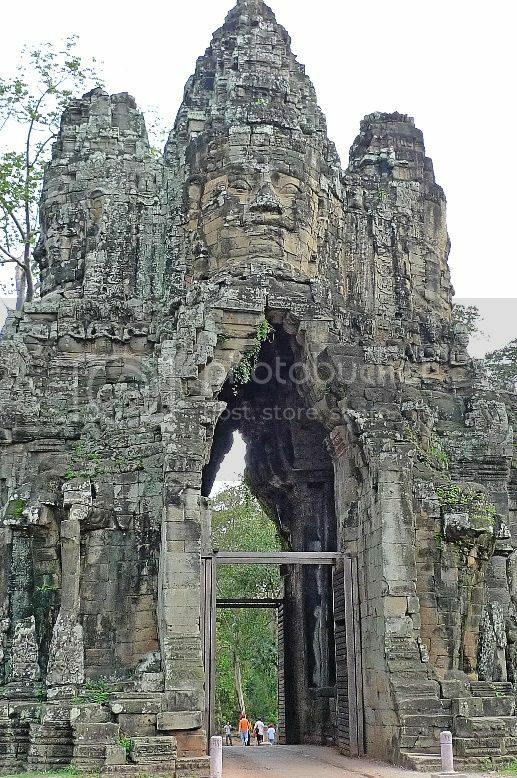 Similar to Victory Gate, the South Gate also had four giant faces, each facing the main cardinal directions. 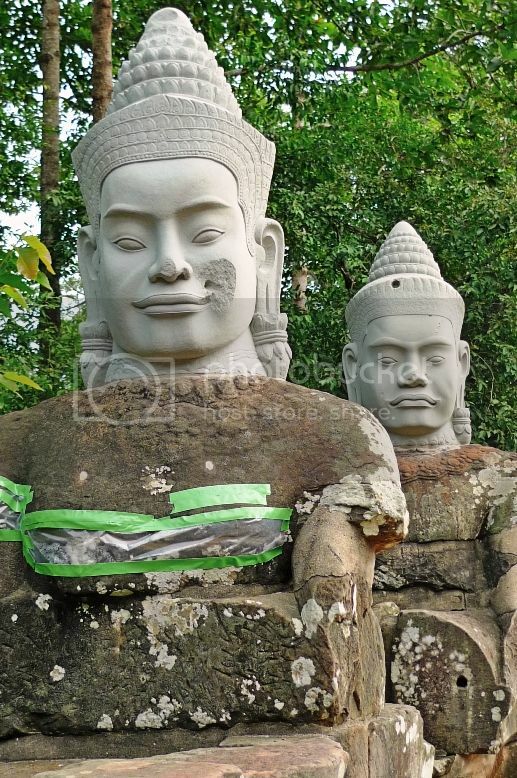 No one really knows who these faces represent but most believe that they were either the faces of Avalokitesvara, the bodhisattva of compassion or King Jayavarman VII, the ruler who built Angkor Thom. 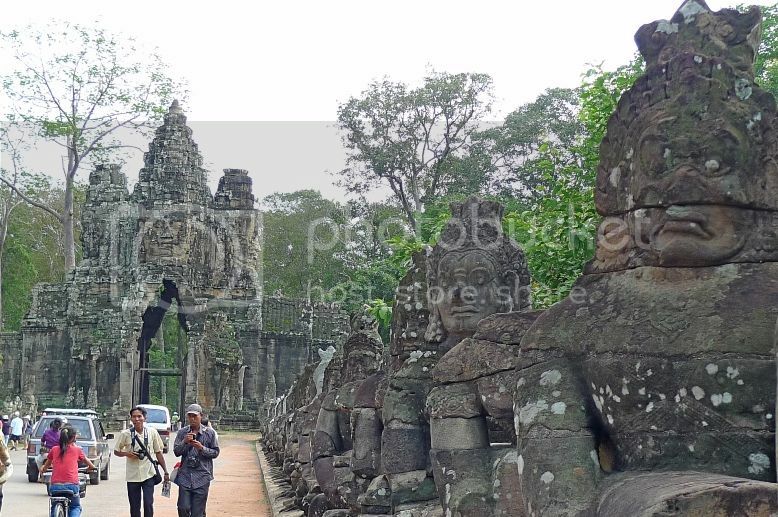 The South Gate was about 30 metres long and 5 metres wide. 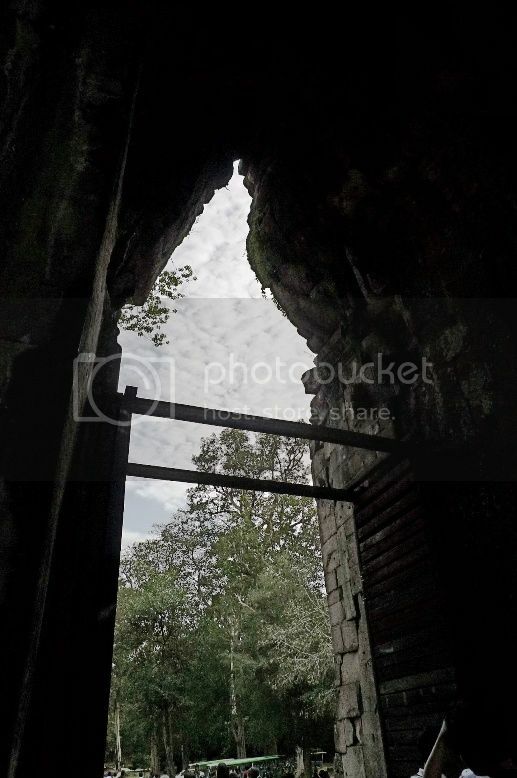 Originally, there were 7 meters high wooden doors on both the front and rear side of the gate, thus trapping inside the tower any one who broke through. We walked pass through the gate. 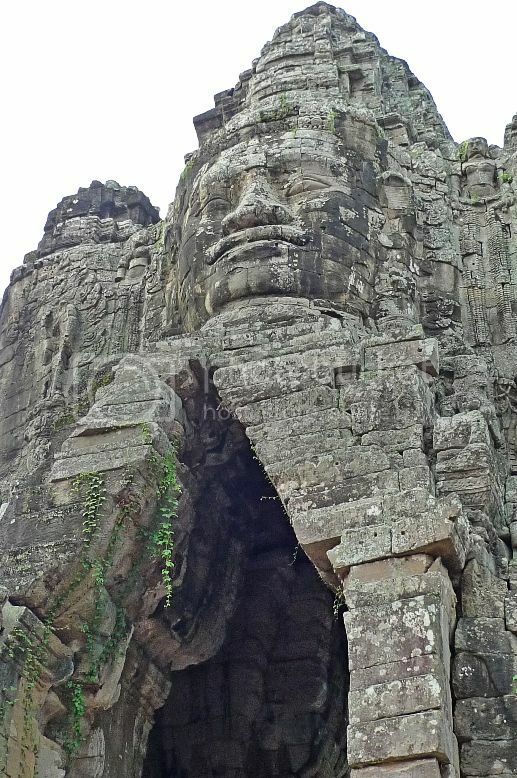 Coming out on the other side, we now stood inside the city of Angkor Thom, with the giant face towering above us. Our driver Xiao He was already waiting for us.